Do you want to keep an item on your store, but out of your feed? There may be some situations where you might want to "unlink" one or more SKUs from a supplier feed so that they no longer receive updates from our automated syncing jobs. Other reasons we haven't thought of yet! The feature is turned on/off at the individual feed level. Meaning if you turn it on or off for one feed, it only applies to that feed. You will NOT have the ability to unlink a SKU until the feature is turned on. Unlinking a SKU will prevent Inventory Source from performing any updates (including deactivation) to that SKU on your platform. If an unlinked SKU already exists on your platform it will not be deactivated or removed once unlinked, it will simply be left alone. If an unlinked SKU doesn't yet exist on your platform it will never be uploaded via our automated processes. You can only unlink SKUs from your feed tab. Meaning, you will not see the option to unlink in your Queue or My Catalog. You can unlink AND relink SKUs on a per product, page, and bulk action level. Go to the Controls tab and find the OFF/ON toggle for the "Enable Unlinking Products" setting. Once you turn it on, you will immediately have the option to unlink products in your feed view. Close your Catalog Rules and go to your Feed View. Within your feed view, search for the product(s) you want to unlink. 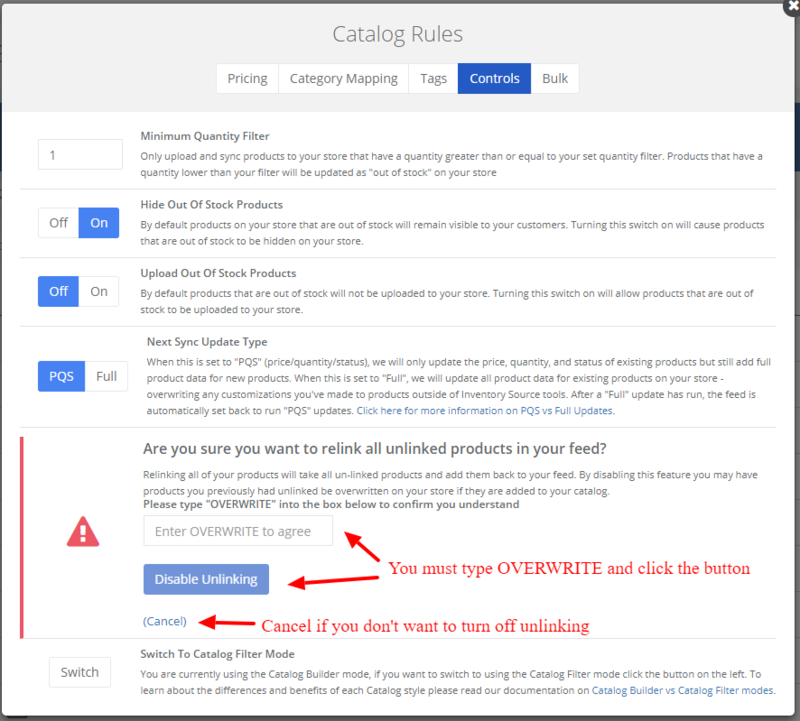 (Remember: You can only unlink products from within the feed view, not your Queue or My Catalog). Once you see the product(s) on the list, you can then select (with the checkbox) "all" on the page or just selected products. (In this example we are selecting more than one product, but in your case, you might only be interested in one product). Once you have the product(s) selected click the blue "i" button to present the option to unlink. Then go ahead and click Unlink. Once you have unlinked the product(s) you will see their status change to an orange Unlinked icon. You can easily find all of your unlinked products (per feed) by selecting the Unlinked button from the Feed View Mode. 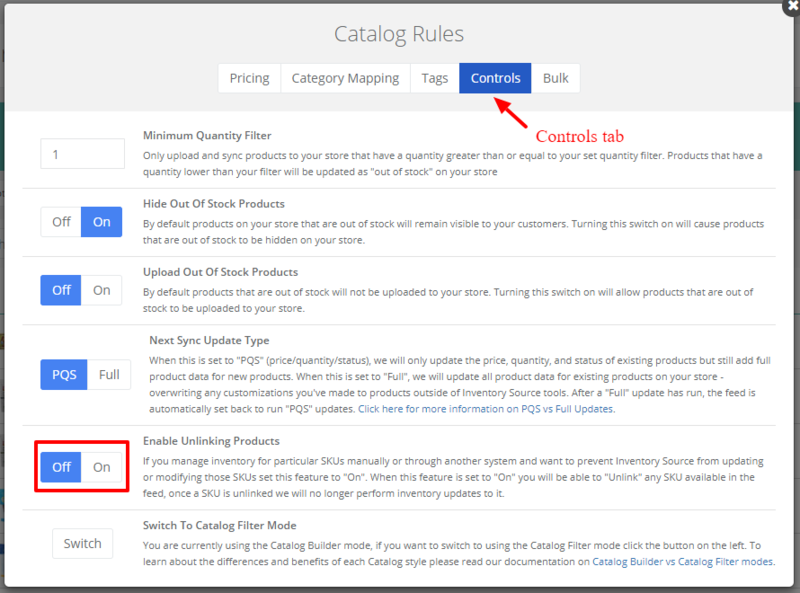 If you want to disable the unlinking feature, go back to the Controls tab within your Catalog Rules. Find the "Enable Unlinking Products" setting and click OFF. When you do this, you will be presented with a warning to ensure you don't turn it off unintentionally. This is because turning this feature off when you already have unlinked products will relink all of those products. (Not a big deal if it's only one or a few products, but could be a real headache if you have a lot of products unlinked). You will need to type in all caps OVERWRITE in the indicated field and click Disable Unlinking. The disable unlinking butting with remain grayed out until you have correctly typed in OVERWRITE.